(CNN) -- Frenchman Anthony Roux took the honors on the 17th stage of the Vuelta Espana on Wednesday as two of Alejandro Valverde's rivals at the top of the overall leaderboard were involved in a crash. 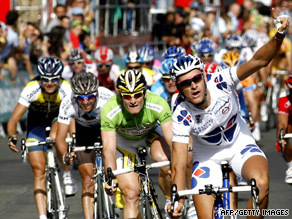 Anthony Roux celebrates victory in Wednesday's 17th stage of the Vuelta Espana. Although neither second-placed Robert Gesink and sixth-placed Ezequiel Mosquera lost any time on the leader following the spill, which happened around the 130km mark, both riders were taken to hospital for tests to see if they will be fine to continue on Thursday. Dutchman Gesink of Radobank is 31 seconds behind Valverde while Xacobeo Galicia rider Mosquera is one minute and 54 seconds adrift of his fellow- Spaniard, with all three finishing in the main pack. The man who ended up claiming victory was 22-year-old Roux, who had been part of a five-man breakaway early on that had led by up to five minutes before the peloton finally got within touching distance of the group not far from the finish line. That looked to have ended Roux's chances of victory, but the Francaise des Jeux rider, who had only finished in the top 100 on three of the previous 16 stages, managed to stay ahead of the pack in the final sprint and he held enough of a lead to keep his rivals at bay. Roux finished the 193km ride from Ciudad Real to Talavera de la Reina in a time of four hours, 28 minutes and 14 seconds, with his fellow-Frenchman William Bonnet having to settle for second spot for the second successive day. Tuesday's stage winner Andre Greipel of Team Columbia took third to continue his fine form. The German now has seven top-five finishes, including three stage wins. Thursday's stage 18 is the 165km ride from Talavera de la Reina to Avila.